Roaches are very adaptable insects, surviving where other insects would be extinct. Because of their adaptable natures they are one of the more difficult pest to control, especially the German cockroach. Roaches are a health hazard, carrying bacteria on their bodies that are transmitted to men. The main diseases transmitted are different forms of gastroenteritis including food poisoning, dysentery, and diarrhea. There are several species of cockroaches. Within our site you will find professional equipment and information about professional strength products that you can use to eliminate roaches yourself. We carry baits and insecticides, pesticides, traps and many other helpful pest control items. 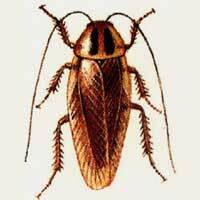 By using our expertly recommended professional roach control products you will easily and efficiently eradicate cockroaches saving up to 70% over using a commercial extermination service. Flea & Roach Spray RTU Qt.